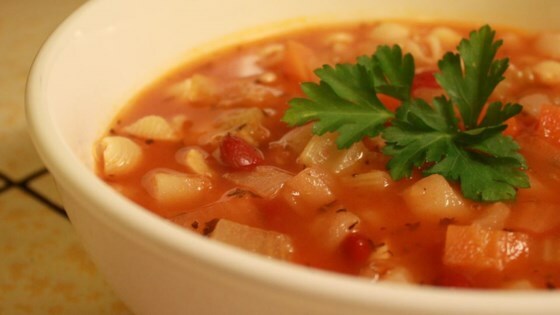 "Hearty and filling vegetarian soup with potatoes, carrots, celery, onion, garlic, beans and pasta. Make sure you have the storage for the left-overs." Heat olive oil in a large pot over medium heat. Stir potatoes, carrots, celery, onion and garlic into pot. Mix in tomato paste, beans, broth and water. Season with basil, oregano and salt. Cook and stir 30 minutes, or until vegetables are tender. Mix macaroni into pot. Continue cooking 10 minutes, or until macaroni is tender.